Jacquelene Acevedo’s musical training started in the dance studio. Classically trained at the New York School of Classical Dance, New York Ballet Institute and in modern dance at Alvin Ailey American Dance Center and Ballet Hispanico –the variety of dance styles later served to inform her musical diversity and understanding. It wasn’t a leap from dance to percussion and drums…it was a translation. 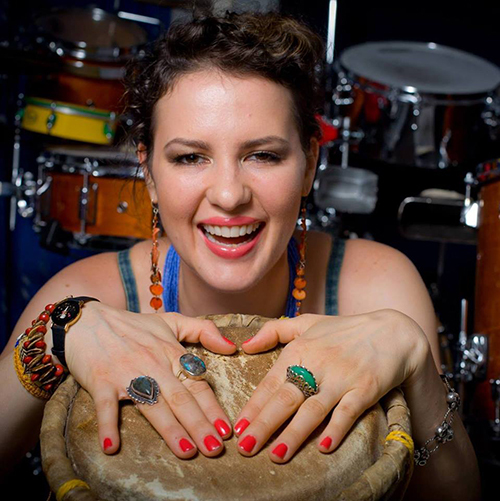 A course of studying rhythms and technique with her father, Memo Acevedo as well as Johnny Almendra, Marvin Diz, and faculty atThe Collective served in helping to translate rhythms once expressed through the body to hands and feet alone for musical application. Jacquelene has since performed in New York City at The Apollo, The Cutting Room, Fat Cat, The Iridium, The New York Botanical Gardens, Rockwood Music Hall, Nublu; in Toronto, Canada where she was born at the Jazz Bistro, Lula Lounge and the Toronto Jazz Festival; and has had the privilege of sharing the stage with Mike Clarke, Liberty Devitto, Ben Butler, Richie Goods, Pat Labarbara, Greg Tardy, Ze Luis, Dom Salvador among others.